Rated 5 out of 5 by yowzasma from A REALLY ENJOYABLE FANTASY GAME : ) After looking over my fellow Fishies positive reviews I just have to say how much I agree with their well written descriptions : ) The story-line, graphics,music, HOGs and mini-games, everything was good. This was one of the most enjoyable games I have played in a while, I especially liked the HOG scenes with their imaginative ways to hide items and the Morphs : ) Brave Giant's people really put a lot of care into this game and and I thank them and Big Fish for making this available to us. If you like Fantasy games I hope you give this one a try :) I am giving this beauty a full 5***** out of 5***** on my personal enjoy-ability scale. Rated 5 out of 5 by Ambrosia81 from Enchanting This game is truly enchanting. The storyline couldn't have been more exciting for me personally as I've always had a fascination with Druids and Elves. The graphics were amazing and I really enjoy the collectables/morphing items. Rated 5 out of 5 by Stephania_Crown from Journey of the Peacekeeper I really loved that in this installment of the Queen Quest saga we take different role, the one of the Peace Keeper! Story is interesting enough to motivate you investigating and going on through the game for the solution that will resolve the conflict between 5 nations. Magic mechanics, along with art in this game, reminds me of one in Tiny Tales: Heart of the forest, which I truly adored! Art is amazing, even hypnotic at times and really adds up to the fairy-like epic spirit of the game. I love how the HO scenes are done, with so much care and details, and I love the world that is built here, starting with the broken parts of the gigantic statues in the main menu. Everything seems so peaceful and beautiful and than you find yourself in the world at the verge of war! That makes it so intense. This game is the real treat for every fan of epic fantasy prose and games, done with the great care, from storyline to the art and level design and I'm so glad I finally have the kingdom in which I can enjoy so much while resolving the fates of the five nations and saving the world! Keep up Brave Giant, this game is the worthy successor to all your previous work! Rated 5 out of 5 by mrfms from It's great! I highly recommend this game!! Rated 5 out of 5 by twinsoniclab from Back to their Best! Way to Go, Boris! This is how to do it! It's as good as their first Queen's Quest! This developer has some absolutely stellar games, with a few, strangely, duds thrown in. This is one of their best. True, a broken truce isn't a new idea, but it felt fresh and was fun. The graphics are wonderful, bright and clean and crisp. No blues overlaying it all, like too many other games. HOS are varied sorts, and some are absolutely amazing! As are some of the PUZZLES! PUZZLES I enjoyed playing, and figuring out without skipping. There are plenty of COLLECTIBLES, a fewer number of several types, as is usual for this developer. (I'm not sure we can use developer names, so won't). Morphs in the HOS, but not just random objects, things we look for, sometimes several of a kind. I've been playing the main game for hours, enjoying the scenery. Really, I didn't do that map puzzle (where you did a puzzle at each stop on the map, before knowing which way to turn) until I'd fully looked at the wonderful artistry. All I can say is, great job to this developer, and congratulations to Boris, who used to "talk" to us here in the old forums! Keep up the good work with games like this, Tiny Tales and Noir Chronicles, and Agent Walker (name change?)! Rated 5 out of 5 by Kay_Erin from Another good Quest! Very nice game, with good clear goals, likable protagonists, and subtle lessons;) This time around we are dealing with an Elven princess, a Druid and a Truce Keeper. Solid story and kept the focus. Particularly liked the villain, in the main game! (no more hints;) Art was very accessible, colors clear and bright. The nature sounds in the background were very charming and heightened the atmosphere. I almost always skip the music; it is usually distracting, which it was in this case (hence the 4 instead of 5 stars) All in all a good successor to the Queens Quest series. Rated 5 out of 5 by blipi69 from Great Game I liked the graphics and the riddles were really nice. I can recommend the game. Rated 5 out of 5 by i1983 from Wow Oh my, this is sooo good game, i realy enyoj it! I immediately buy it. The sound, and colours are great. The story is super. I can only wait to play it again. Rated 5 out of 5 by skullfun from ~~~ENTER THE PRESTIGIOUS FANTASY REALM IN QUEENS QUEST IV~~~ This is Brave Giant's fourth installment in the Queens Quest Saga and developers have created a spellbinding adventure with a unique story twist. I've played a lot of different characters in a lot of different games. I have been thrown into the role of just about every kind of Detective imaginable and Scientist, Hero/Heroin, and the list goes on. 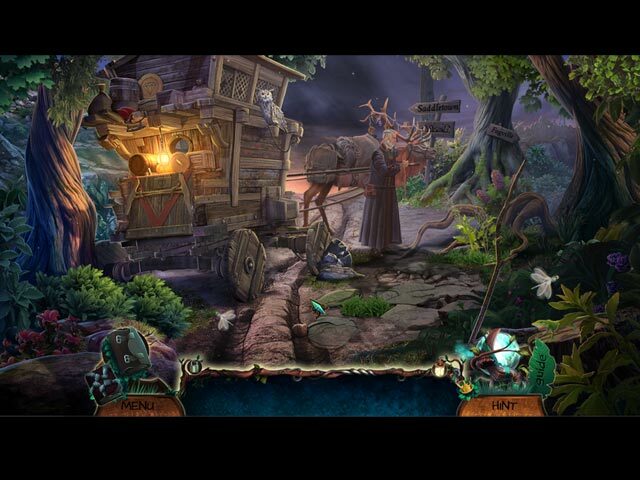 Now playing the role of Peacekeeper in Sacred Truce you must embark on a journey once again into the five realms. Your quest begins by travelling to Saddletown to find the magical "Sacred Truce". War has erupted between the Elves and Humans when you learn that the Elven King has been attacked and possibly killed...and the hostile Elves believe a Human is responsible. The Druid of the five realms created the Sacred Truce to ensure peace among the Elves, Goblins, Dwarves, and Humans but now the Sacred Truce is missing and it's up to you to locate it. After you arrive in Saddletown you soon discover that the Elves have issued a $5000.00 reward for anyone who can capture Rosa Mozak "the betrayer" dead or alive. Is it possible that Rosa is the betrayer who stole the Sacred Truce or is there more information to this accusation? You'll soon find out as your investigative journey takes you deeper into the magical five realms! 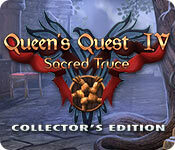 Queens Quest IV is a casual adventure game that takes place in the most prestigious of fantasy realms. Your time in Sacred Truce will be split between exploration centric adventure scenes and some nice hidden object diversions. You’ll get a surprising amount of freedom to roam back and forth, searching for items that can be used to open doors or remove other obstacles standing in your way. Many of these items are interactive, meaning you’ll need to click and tinker with them to find out their true nature, occasionally even using other inventory items on them. 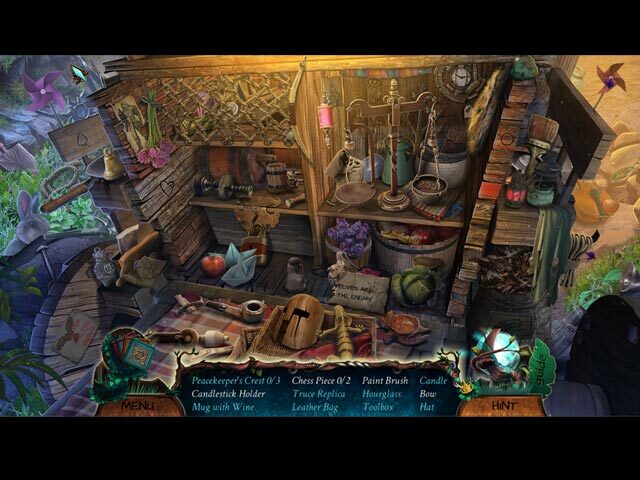 Hidden object scenes come at a fast pace, which isn’t such a bad thing since they’re quite entertaining to solve. Most of them stick to the standard text list format with one or two interactive items marked in a darker color. Just search, click and collect, you know the drill! 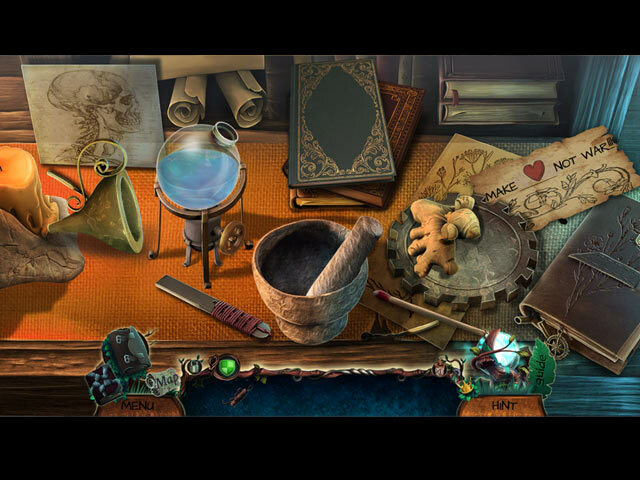 Mini-games manage to be equal to the hidden object scenes with a glorious array of variety. Sacred Truce doesn’t take a lot of newly innovative chances with its design or gameplay content. It wins major points with me for its interesting story, like the previous editions. The puzzles and mini-games reach out and grab you from the start, saving an otherwise ordinary hidden object game from the dustbin. Other reviewers include CE bling so no need to revisit that. I do have to give this the 5 star rating because Brave Giant held their own with the continuation of this wonderful series. I generally do not like to review an entire game based solely on demo, I played this jewel in it's entirety. I love the series and look forward to more releases. Cheers! Rated 5 out of 5 by Companion4ever from Very well crafted fantasy game I am surprised at the negative reviews. I found the HOPS challenging. Yes - the minigames could be easy. I thought the story was great and the characters well fleshed out. I consider this an 'adult' game with high fantasy elements. I also like dark and mysterious games. I always go for story - if you like a good story with believable characters then this game is for you.